Draw a portrait using light and shadow- place the light from different angles than "normal" -under the chin, behind the head, in front of the face. Study your feet and shoes. Draw them in different positions and from different angles and views. 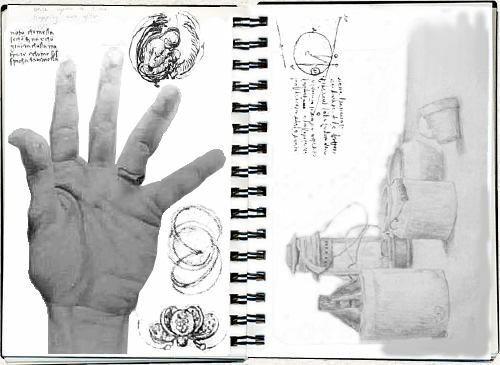 Draw studies of your hands. Try a variety of positions or overlapping them. Draw a figure in an environment from your observation- in motion, and standing still. Draw in imaginary place- remember to show rich details. Do a self portrait. This can be full body view or face only. Accuracy!! Gesture drawings of people, things, or animals in motion. Contour line drawings of figures or objects. Draw several studies of your eyes, nose, and mouth in a variety of positions and poses. Focus on drapery and pattern: a shirt over a chair, a sheet around a banister, etc. Draw everything you can see from where you are positioned: this can be from imagination, like if you were in a hot air balloon, ant sized, etc. Draw a man made object. Draw a metallic object and everything you see in it. Draw or design any kind of vehicle. Draw an object of interest from 3 different views. Draw using 2 point perspective. Draw the inside of a mechanical object. Filling the page with them, overlap two dimensional forms and pick a direction for the light to hit them from. Shade accordingly. Draw your reflection in any shiny surfaced object. Draw a landscape from observation. Remember to show foreground, middle ground, and background. Draw your home and what's around it. Draw family members with things that they cherish. Draw the interior of your room and what's in it- from wherever you're sitting: on floor, up on bed, from ceiling looking down. Study the forms, shapes, lines and textures and colors of trees. Draw a plant with as much detail as possible using line contour and line variation. Arrange a still life and draw it with shading. Draw bottles and cans- have the cans crunched up for lots of detail and contrast to the bottles' smoothness. Draw dishes in a drainer, with shading. Create a fantasy building and landscape. Create a series of positive and negative space designs. Draw a piece of furniture and use color to show the textures and shadows. Draw a still life with one to three pieces of patterned cloth in it. Show color and patterns. Focus on textures in a drawing. Using color (no black) and light (white) create a Impressionist style landscape drawing- remembering to optically mix colors by placing compliments next to each other. Transform an object from a realistic view to a Cubist representation (using several different view points within the same frame) in a progression of 4 steps. Draw yourself using a strong light on one side or angle of your face, focusing on the shapes of the shadows of your facial features- excellent shading practice. Try several studies of DRAPERY- a towel, shirt, or blanket draped around or on another object to create lots of wrinkles; focusing on shapes of folds and creases and the shadows that are created by them. Advanced drapery- try the same exercise with a patterned cloth in color. Take out a library book on any artist of your choosing and duplicate their art work. ­Please make a Xerox copy of it for my reference. Create a series of drawings of people in motion- playing sports; doing housework; etc. Try to overlap several views of the action as it progresses- use light sketchy lines; it will help. Design a tattoo for someone particular- a celebrity; teacher; etc. Draw from imagination with s much rich detail as possible- if you were awakened by a crash in the middle of the night; what would it be from ?? Draw yourself 50 years from now; including your surroundings, possessions, etc. Illustrate a favorite story of yours told by a grandparent; uncle, or other relative. Draw your greatest fear; your biggest hope; or your dream for your future. Draw a series of animals in motion. I no longer set up still lifes. I have small stations where students bring their own objects and make arrangements that have meaning for them. I always ask that they "extend" from the drawings. Where do ideas come from? I get ideas from looking, looking, looking. Pay attention to what draws you to certain objects, colors, and textures. Look at how you arrange your favorite things. What are your favorite things? These exercises are to help you find those relationships. I was looking at a bunch of stuff that sits on a shelf in my workroom -- a miniature model of a bi-plane sits on top of a bunch of tape cassettes that I no longer listen to and not far from them is a 4'globe made from old bed springs. They were placed on the shelf arbitrarily but as I looked I began to see a relationship. The plane looks like it is about to take off from the stack of tapes and circle the globe. Suddenly these small things became the basis of a little painting for me. Stuff I look at everyday, but don't really look at became something I could use to say something about my flying. 1. Find 2 or 3 objects that seem to have no relation to each other. Arrange and draw. 4. Create an assemblage that includes 3 sticks, 3 round objects (all the same or similar size) a base or bases, and anything else you chose. Draw the assemblage. 5. Find something that you or your parents kept of yours from when you were a small child. It could be something you made, a favorite toy, an article of clothing. Draw it in a context that gives meaning to the "saving." Why was it saved? 7. Find an actual object to scan. (Find something small and relatively flat. It can be natural or man-made.) Include some kind of background. Manipulate the scan in Photoshop . Draw from the manipulated scan. Where can this go??? Select 10 compound words for each journal due date, and create an image that evokes the meanings of both words in a combined fashion. You may also select words of your own from a dictionary as long as you check with the teacher on their appropriateness first. Use any media or materials you wish. Each drawing MUST be a full page in size. This unit gives each student an image of a zipper and challenges them to include it within a creative art work. First imagine it as part of something OTHER THAN as part of a piece of clothing. Look at it from all directions. You may use one or both of the zipper images. Once you get an idea… continue to think … often your first idea is one that every one has…. .
Use all the time provided for art making. Following directions... Using the whole paper and creating some kind of background. Using a variety or lines textures and areas of black. Clean up & Use of class time.